If you are looking for easy to make and fun Christmas Cookies, these Snow-Covered Coconut Christmas Tree Cookies are just the thing. The dusting of ‘snow' and sprinkling of edible gold stars really make these cookies so very special. Hello my friends! Well, despite my best efforts, it seems like there is no way to slow down the march of time and Christmas keeps inching closer. And that's okay; with Kate home for a few days over the Thanksgiving holiday, we did a ‘speed-decorate' and now our home looks ever so festive. Because we only had so much time before she needed to get back to school, we were incredibly efficient and it got done speedily! We were also able to get a little baking done and these Snow-Covered Coconut Christmas Tree Cookies were a big hit…as in, they are all gone! And…as if they couldn't be any better, they are also gluten-free! When Kate was in Middle and High School, we would host a Christmas Cookie Swap for her friends and their moms. It was such a great opportunity to enjoy the holidays and expand our cookie repertoire in the process. We would ask our guests to bring a couple of dozen cookies and then they would be able to gather an assortment to take home. These Snow-Covered Coconut Christmas Tree cookies were our contribution at several of our gatherings. Kate originally found this recipe on Martha Stewart's website and we've pretty much stuck to Martha's recipe. One year we did add some mini chocolate chips to the batter which did add a little something extra. I mean, COCONUT PLUS CHOCOLATE! One of those combinations made in heaven. That little house? I bought 2 of them probably 10 years ago and they always sit at my children's' place settings on Christmas day. They are German incense ‘smoker' cottages and I was pleased that you can still find them…on Amazon of course. And I know you're thinking ‘incense on Christmas? '…but the incense is lightly scented pine, fir, and gingerbread scents. And really, you're just aiming for the smoke that comes out of the chimney of your little cottage or the pipe of your German Smoker. Don't you just love seeing these little cookies in the midst of the snow storm? 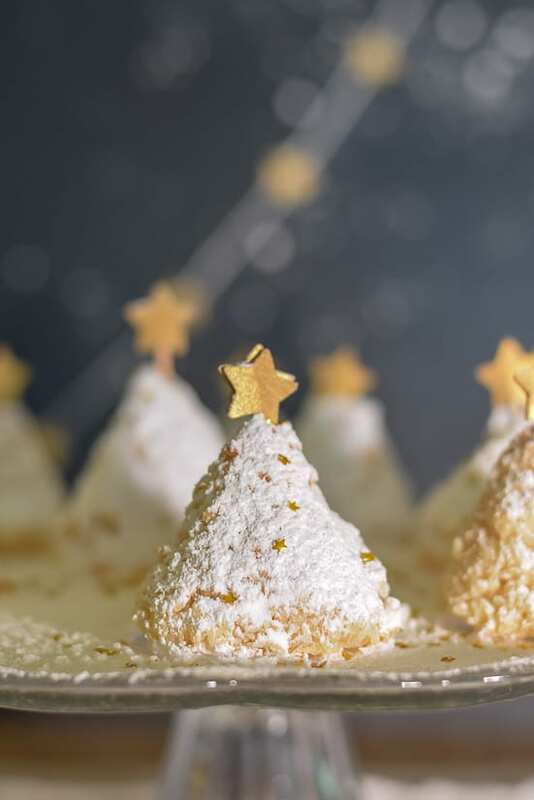 This Coconut Christmas Tree cookie recipe is so incredibly easy, but if you love coconut macaroons, you'll love these little morsels of yumminess. A very easy recipe to make coconut Christmas tree cookies. For added effect, add a dusting of powdered sugar 'snow', some edible glitter and a gold star. Thoroughly combine coconut, granulated sugar, egg whites, vanilla, and salt in a large bowl using your hands or a wooden spoon. Form 2 tablespoons of the mixture at a time into 2-inch-tall trees with your hands, using your fingertips to make pointed tops. Transfer each tree to a parchment-lined baking sheet, spacing them 1 inch apart. If you are going to put the little stars on after they are baked, then poke a toothpick through the top so that after the trees are baked the toothpick holding the star goes in easier. Bake until edges are golden and trees are firm, 12 to 14 minutes. Let cool on baking sheet on a wire rack at least 15 minutes. Cookies can be made up to 1 day ahead. Two tablespoons of the batter are all you need for one tree. Pinch the top to get the point of the tree. Don't smooth the sides too much, you want them a little ‘rough' to resemble the tree's boughs and for the ‘snow' to have somewhere to collect. While the cookies are baking and cooling, punch out your stars. I used a 1/2″ star paper punch and glued them on to half of a toothpick…the blunt half so that the pointy end goes into the tree. I had such a great time photographing the'snow', never mind that my kitchen was covered in powdered sugar and that I cleaned it up for days! Pin it for future reference. Seriously, if you need some quick Christmas cookies, this is your recipe…The snowstorm is optional. Thanks Jeanette! They were so easy and are quite different. Think I’m making more today since my original stash is all gone…17-year old son made short work of them. Wow, these snow covered cookies are so pretty and look perfect for the holidays! I’m thinking I need to give these a shot ASAP! Hi Hayley…I surely hope you enjoy them as much as we do! They are so easy and so very delicious. These are SO gorgeous! And I’m pretty excited that they appear to be gluten-free… no flour! So glad to have you on the tour this year!! Hi Sondra, they are gluten free…you just reminded me that I need to put that in the post! And thanks for organizing this wonderful ‘hop’. I am truly thrilled to be included with such wonderful other bloggers. Hope your week is off to a good week. These cookies and your photography look absolutely magical. I think this is something I’m going to have to try with the kids this year. Aw Leanne…such kind words. This are so easy to make that I know you and your kids will love to make…and eat them. Thanks for swinging by today. I hope your week is off to a good start. Hi Emily! Thanks for swinging by today. Luckily, they are so easy to make, so you can eat them without remorse. My 17-year old polished off the first batch so I’m making another batch right now! These pictures are beautiful! I feel like I’ve entered a winter wonderland. Amazing work!! Thanks Nicole! I had a ball making and photographing this winter wonderland, especially when it was 72′ outside! This dessert looks so good, Lynn, and it makes such an attractive scene. I love how you made it snow in a few of your pictures. It almost looked like the real thing! Hi Paula, don’t you just love that snow!!!??? I had such a fun time making and photographing the blizzard. Thanks so much for swinging by and I’m thrilled to be in the hop with you! Okay, these are thee cutest things! Love the dusting of snow… it’s the perfect finishing touch! Hi Karly, and thanks for coming by today. These are so easy to make, if you like coconut you need to make them. I promise you will love them. lynn, those trees look so delish. i am a big coconut fan so i am sure these would be right up on my favorites list. it looks like you had a fun time taking photos…the clean up, not so much i’m sure. Hi Laura, oh if you love coconut you will love these. And they are so very easy to make. Give them a try…with or without the snow storm! The snow adds such a magical touch! I have to do this! I’m such a coconut lover and I want to make your cookies ASAP. They look delicious and are so pretty. Hi Alli, the snow is key! And I’m so glad you are going to bake some. You will not be disappointed…so easy, so delicious, so fun. Thanks for swinging by today and wishing you a very Merry Christmas. These are so adorable! Coconut is one of my favorite things in cookies, I will definitely be giving these a try! Thanks for sharing! Hi Lydia and thanks for swinging by today. These little cookies are the perfect combination of easy, delicious and fun! I’m so glad you are going to try them, I know you and your family will love them. These are just adorable, Lynn! And I love coconut so they’re on my to do list now. The pictures look great and I’m sure it was lots of fun making the snow, even if it was messy. Hi Angie, no only are they delicious and fun to look at, but they are really so very easy to make. And I did have a ball making and photographing the snow storm. Thanks so much for swinging by today and for leaving your kind compliment. I hope you and your family are enjoying a wonderufl weekend. So beautiful… almost too pretty to eat! Thanks Maryann…and they are so very easy to make with so few ingredients. They are becoming a go-to cookie for us because you can’t beat the ease and deliciousness. I love these cookies, Lynn. In fact, they are so much more than just cookies. They are tiny works of art. So pretty and the snow is the icing on the cake. Happy Holidays my friend! Aw, thanks Mary. They were so simple to make, but are so very tasty. That snowstorm was just fun to do. Thanks for coming by today. I wish you and yours a very merry Christmas. Lynn… these caught my eye around the interwebs before I even stopped by. I couldn’t wait to learn more. And oh how I want to sample one now. I LOVE your sweet snowstorm, too. Enjoy the spirit of Christmas!! Hi Diane, and thanks for swinging by today and sharing your kind compliments. These cookies are so very easy to make and are so very tasty too! I hope you get a chance to make and enjoy them soon. These are quite possibly the cutest darn cookies I’ve ever seen! Pinned! Aw thanks Heather! They are so very easy to make and are so very tasty! I’ve made 2 batches already as my son devours them. These are the most beautiful cookies I have ever seen! Gold stars and glitter, wow! Pinned! My kids will be so impressed! Aw Jessica, thanks for your sweet words. Those cookies are so easy to make and so very tasty as well. I hope you and your kids get a chance to make them and enjoy them. So cute and I love anything with coconut so I know that they must be as good as they look. Love your photos with the “snow”, too. And what is not to love about Coconut!? It’s just about perfect, right? Hope you get a chance to make these, i know you’ll enjoy them. And they are really very easy to make, with or without snow! Thanks for coming by and wishing you a very Merry Christmas. Wow…these look too pretty to eat! They sound delicious and we can’t wait to give them a try! So fun hopping with you! Hi Vicki and Jennifer…yes…it was fun hopping with you. And thanks for your kind compliments. Hope you make them and enjoy them. These cookies are the most beautiful cookies I have ever seen and I mean it! Your photos look stunning! 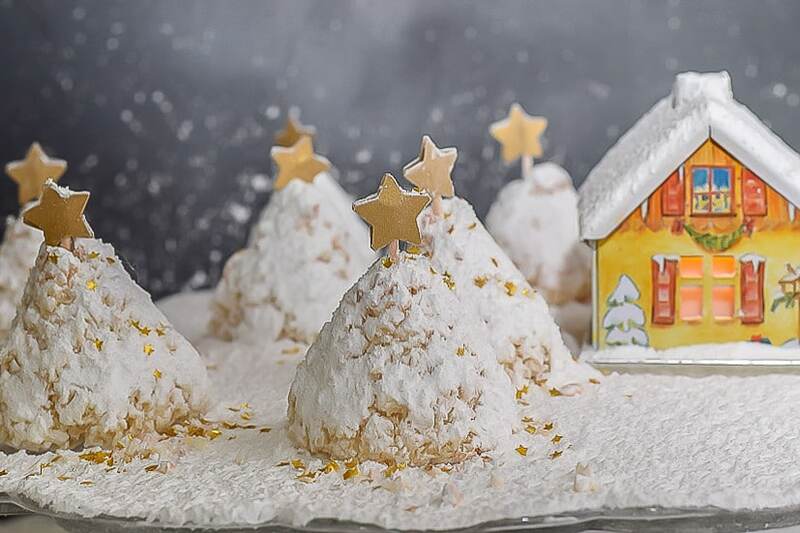 Winter Wonderland Treats that are too pretty to eat! But I would love to try one. They look magical and I’ve never seen anything like it. oh why don’t I live closer! Aw friend, I do wish you lived closer. I would bring some over to you right now. I have had to make a second batch and would give you some before my son eats those too. And truthfully, they are so easy. Your and your girls would love to make them. Lynn, I love them so much I’ll be featuring them at tomorrows Sweet Inspiration Linky!! just wanted to let you know, have a great Thursday! Thanks Katrin! And thanks for featuring my little trees. I’ll be sure to pop over and socialize at party. Aw, thanks Michelle! I had such a ball taking those photos! I’m still learning with my camera and this was a good exercise for sure. Thanks so much for visiting and for pinning. I hope you enjoy them as much as we do. These are so beautiful! I can’t wait to try them! The photography is gorgeous – it was hard to pick which photo to pin on pinterest! Hey Christa! You are so sweet! And your boys will love them…very coconutty! I know you are in for some fun times this month… I miss the days when my kids were the ages of yours…Soak it up! Kisses to all your boys. These are adorable! And I love that they are gluten free – I am always looking for tasty gluten free recipes to make for my mom. Will have to try these this year. And thanks for coming by. I do love those Coconut Christmas Trees…I’ve made a couple batches so far this season as my son loves them. And gotta love that they are gluten-free. I hope you enjoy them as much as we do. The falling powdered sugar snow totally takes these pictures over the top. What a great recipe and a beautiful scene!